I can’t remember the last time I saw stars shining this bright; even the Milky Way is glowing to the naked eye. When my eyes drift back down to earth, I notice the walkways lit with lamps a few inches above the grass, their soft starburst-shaped light the only illumination. 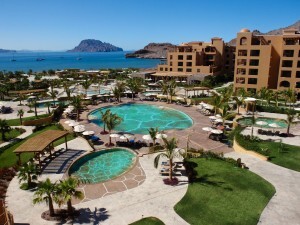 At the Villa Del Palmar at the Islands of Loreto all other lights above waist level have been doused for the night. It’s efforts like these — small but part a cohesive larger plan — that mark the great lengths to which this resort’s staff and its developer, the Villa Group, have gone to create an immersive ecologically sustainable experience from the ground up. Only 250 miles north of Cabo San Lucas on Baja’s eastern shore, a new community is being built sustainably. With consideration for the local environment, the developer purchased the land — formerly a private conservation and wildlife preserve with a very small unknown hotel — and submitted a plan for low-density development to continue conservation work and share this eco-resort with travelers responsibly. The master plan for Danzante Bay eventually calls for about three resorts and less than 250 homes; this is sprawling over 4,400 acres spanning from the sea to the surrounding mountains. It’s important to note that the developer was approved for 5,200 hotel rooms but self-regulated down to a maximum of 2,000, which will be divided over a yet-to-be-determined number of resorts. According to Mario Cortes, Villa Group’s program director, the strategy incorporates very low utilization targets of 20 percent development for building, with the remaining 80 percent dedicated for nature and wildlife conservation. The pride in Cortes’ voice was evident when he explained that sustainability efforts extend to the two nearby fishing village communities of Ensenada Blanca and Ligui that are being supported as part of responsible development. During the past five years, Villa Group has brought in needed utilities like water, electricity and trash collection. Additionally, the developer donated a library and Internet cafe for the residents. Sixto Navarro, general manager of Villa Del Palmar Loreto, also takes pride in his company’s support of the local community in recruiting and staffing efforts for the resort. Rather than transplanting staff, hiring from the local communities is preferred and paired with on-the-job training and career-management programs. I had the opportunity to go on a behind-the-scenes tour and I was impressed by the engineering that supported this ecologically harmonious resort. The heating and air conditioning systems, for example, use waste water to cool systems and for general refrigeration. Warm water is used to generate heat for the Jacuzzis and pool. Once that water cools down, it’s used to cool off equipment, until it returns to a threshold temperature and becomes warm water which can be recycled for more energy in the system. The whole network is a dizzying array of back and forth designed to conserve energy and water. Villa Del Palmar Loreto has an onsite desalination plant to make fresh water from the salty ground water using high-efficiency reverse osmosis. Although local rules allow for the remaining waste water to be discharged into the ocean, Villa Group has opted not to do this. Instead, the resort uses the water for irrigation. Included in the master plan are efforts to conserve, nourish and support the existing communities of protected wildlife. 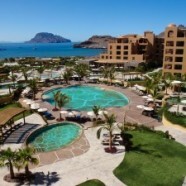 The Villa Del Palmar Loreto shares it’s neighborhood with one family of pilgrim falcons and several bighorn sheep in the nearby mountains. Employees of Villa Del Palmar Loreto talk about the falcons and sheep as if they are friendly neighbors or nearby family. During construction, Villa Group carefully relocated a large colony of zebra lizards rather than displace them. As part of its ongoing commitment to these endangered species, Villa Group started a program in 2010 to protect and nurture turtle nests. Sea turtles swim to shore where they burrow and plant their eggs on the beach. The company is proud that, in 2011 alone, it assisted seven nests that spawned about 100 infant sea turtles each. Efforts included nest protection, education of the local population and children’s activities on the importance of conservation and the environment. By including fun programming for children and families to share in protecting the turtles and releasing them back to the ocean, Villa Group hopes to engender a sense of eco-responsibility in the villages’ next generation. The bulk of the resort’s main buildings have been completed with several wings open and ready to receive guests. Over 180 suites dot the resort so far, with the smallest standard suite starting at about 650 square feet. Units feature truly oversized balconies. These balconies are noteworthy, being at least double the depth of the average balcony to allow plenty of room for patio furniture, moving around and hosting multiple guests. The rooms are decorated in tasteful neutrals and earth tones, and feature a kitchen, living area, bedroom and a washer and dryer. For more demanding guests or groups seeking spaces to entertain, Villa Del Palmar Loreto offers massive penthouse suites that have panoramic patios and wraparound terraces with breathtaking island, mountain and ocean views. World-class food and beverage is available across three restaurants and 24-hour room service. At the Marketplace, themed nights and buffet like the Saturday Mexican Fiesta also showcase folkloric performances by the staff. Being ecologically sustainable doesn’t mean your clients have to do without the pampered luxuries. The resort’s spa is massive, almost 40,000 square feet. It offers a separate men’s and women’s area, each with hydrotherapy salt baths, warm and hot tubs, cold plunge, sauna, steam and Swiss showers. For romantic privacy, couples’ rooms with private jetted tubs are also an option. Vaulted ceilings with glass walls create a sense of openness and join the earth and mountains outside with the pools of water inside. Completing the resort’s eco-experience, local treatments often embrace organic ingredients like mud or salt from the Sea of Cortez. A full menu of treatments combines techniques from around the world, such as Reiki and Shiatsu, to offer guests responsible elegance. Make sure you suggest an early morning beach stroll to your clients. Dozens of tide pools form naturally around the property, and they’ll have an opportunity to connect with plant and wildlife. Guests can spot numerous fish and shellfish, including chocolate clams, angelfish and lionfish. Sightings of dolphin and seals in the ocean are not uncommon. Downtown Loreto offers culture, cuisine and history. 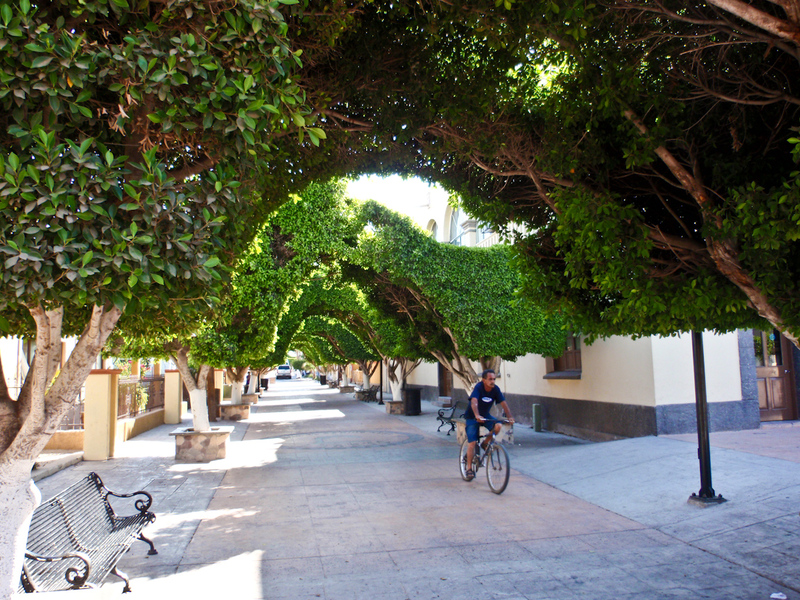 The first mission established on the Camino Real that runs all the way up into California is tucked in a quiet corner off the main square. A visit to the area is incomplete without an excursion to the UNESCO World Natural Heritage protected islands. Surrounding waters can be so calm as to offer unparalleled snorkeling, boating and diving. The relatively low volume of visitors to this still-undiscovered area translates to more authentic eco-experiences. As I wrap up my evening stroll of stargazing and head back to my room to rest for the night, I wonder how it’s possible that I could have had such a full day, but at such a leisurely pace. With a smile, I realize that Loreto offers that rare blend of activities in such harmony with nature that just partaking in them is rejuvenating to the heart, body and soul. For now, this remains the undiscovered gem of Baja Sur, an eco paradise set to the pace of relaxation. First published in TravelAge West magazine, September 28, 2012.